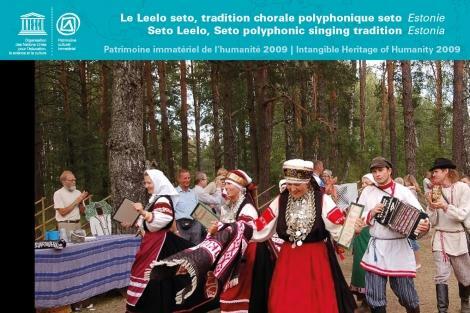 "For the Seto community living in south-eastern Estonia and the Pechory district of the Russian Federation, the tradition of leelo, an ancient polyphonic singing tradition, is a cornerstone of contemporary identity. Performed to traditional melodies and in traditional costume, leelo features a lead singer who delivers a verse line followed by a choir that joins in for the final syllables and then repeats the whole line. Although lyrics are sometimes learned from former great performers, skill in composition is the mark of an excellent lead singer. Most choirs are composed wholly of women, and the most notable lead singer is crowned on Seto Kingdom Day as the King's 'Mother of Song'. Singing formerly accompanied nearly all daily activities in the Seto's rural communities; today, although it is increasingly restricted to stage performance, the tradition remains prominently alive in community events as a central, vibrant and highly valued element of Seto culture. Popular among tourists and a source of pride for the Seto, leelo choirs are the hubs of their community and the embodiment of local identity." Authors and personalities: Helen Valkna-Piret Suurväli, director. Production: Estonian Public Broadcasting, producer.